Nestled in a large garden with an outdoor pool, this 3-star hotel offers a green and relaxing setting at the foot of the St. Cassien hill. Ideal for business and tourism trips on the French Riviera, it is 2 minutes from the A8 motorway and Cannes Airport. The beaches are 1.5 km away, while the centre of Cannes, the Croisette and the Palais des Festivals are 6 km away. Our comfortable and well-equipped rooms are available for 1 or 2 people. Connecting rooms are available for family holidays. Equipped with flat screens with cable and Canal Plus channels and courtesy trays, these rooms invite you to rest and relax. Additional beds for babies and young children are free of charge. The restaurant is located in the garden and is extended by a large covered terrace surrounded by greenery. It provides a setting for business lunches, family meals or dinner with friends. We serve French cuisine and exceptional local specialties. Campanile traditional buffets offer diverse and delicious choices for all ages. Lunch 12:00 pm to 2:00 pm. Dinner 7:30 p.m. to 10 p.m.
Close to the business district and Cannes Mandelieu Airport, the Hotel Campanile provides a convenient location for business meetings. It accommodates up to 30 participants. The hotel, situated near tennis courts, bowling lanes, and 2 golf courses, provides an ideal location, 1 km from the Coubertin Stadium and the Palais des Victoires. The hotel is fully accessible for guests of reduced mobility. 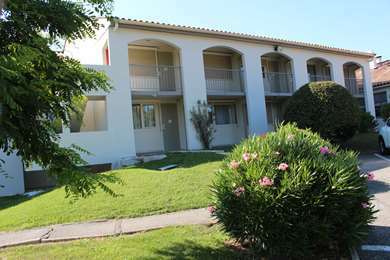 The Campanile Hotel Cannes - Mandelieu has 97 air-conditioned rooms which sleep one or two guests, including interconnecting rooms for families. All rooms have quality Simmons bedding. For children under ten and babies, a small extra bed and cot are available free of charge on request. All rooms feature flat-screen televisions with cable and satellite channels, tea and coffee-making facilities including herbal teas and biscuits, and a bathroom with a bath or shower, toilet, sink and hair-dryer. The Campanile Hotel Cannes is fully accessible for guests with reduced mobility. Boost your vitamin intake with our breakfast buffet, served from 06:30 to 09:00 during the week and 07:00 to 10:00 at the weekend and featuring tea, coffee, fresh fruit juice, cereal, pastries, cold meats, yoghurts and, of course, our fruit salads. At the Campanile Hotel Cannes - Mandelieu you can sample regional or traditional cuisine, whether you're enjoying a light lunch or a family occasion. Choose from buffet options, à la carte dishes and a children's menu. Lunch and dinner are served from 12:00 to 14:00 and 19:30 to 22:00 respectively. Room service is available until 22:00 but must be booked in advance. The Hotel has a pleasant terrace next to its swimming pool which is open in summer. From the North : from Grasse take the fastway to Cannes and take the A8 to Aix en Provence, leave the A8 motoway at first exit 41 Cannes la bocca. Follow Aéroport Cannes/Mandelieu road signs. From the East : from Cannes take the coast road (Boulevard du Midi) towards Mandelieu / La Napoule. At the roundabout Espace, follow Aéroport Cannes/Mandelieu road signs. From the West : from Mandelieu take the A8 motorway, leave at exit 41 Cannes/Mandelieu. Follow Aéroport Cannes/Mandelieu road signs.